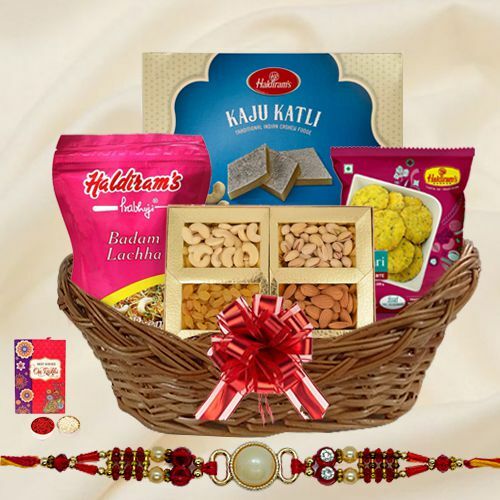 On the joyous occasion of Raksha Bandhan, make your bond stronger with your dear ones by ordering this Auspicious Rakhi Basket of Savory Delights delightfully combined with a free Rakhi, Roli Tilak and Chawal. The Basket is comprised of Assorted Dry Fruits (200 gms), Haldiram Kaju Roll (200 gms), Haldiram Badam Lachha (200 gms) and Haldiram Methi Mathri (200 gms) . There might be a slight change in the displayed design of Basket.